Even the ultra-Europhile Guy Verhofstadt applauded after Juncker had finished his State of the Union address yesterday morning in the European Parliament, an ominous sign! Brussels’ cheerleading journalists were euphoric as never before. They agree with Juncker and Verhofstadt that the ’populist spring’ was halted in Austria, the Netherlands and France, ignoring that in the next Austrian elections nationalism may be close to winning. Commission President Jean-Claude Juncker obviously chose a federal EU future and deepening of EU integration in his one-hour speech. 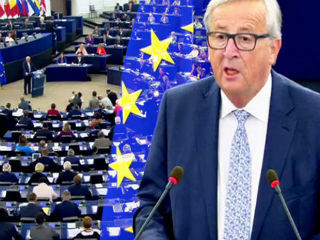 He had no proposals for reforming undemocratic EU institutions such as the Commission and the Euro Group, for instance, but only a wild idea that the Commission President could be the same person as the Council President, 'elected' by the European Parliament. Just like an EU mother hen, Juncker wants all the EU member states in a united Eurozone, even extremely corrupt countries such Romania and Bulgaria. He ignored completely the fact that some member states don't even wish to be in the Eurozone: Poland, Denmark, Czech Republic, Hungary, Sweden. Brussels' cheerleading journalists were euphoric as never before. They agree with Juncker and Verhofstadt that the 'populist spring' was halted in Austria, the Netherlands and France, ignoring that in the next Austrian elections nationalism may be close to winning. In the Netherlands Geert Wilders' party is the second largest one, leaving him out of forming a new government has resulted in a hard job that has already taken 5 months. FN leader Marie Le Pen got millions of votes in France: of course, the wonder boy Macron won the Presidency, but 55% of the voters stayed at home and his popularity after a few weeks is even lower than that of his unpopular predecessor. The threat is not over, on the contrary. Wouldn't it be better if the EU elite, including their devoted media, were to pay more attention to these facts instead of resting in the complacent behaviour of 'we are the champions' and everything is ok again.